When the demon Beltrid demands that Sisko use his supernatural ring for evil, Sisko’s refusal turns his world upside down. Trapping Sisko’s wife, Beltrid sends Sisko and his teenage children on a journey to free her. Book 2 of the The Reality Chronicles series, fantasy for teen readers and older. When the demon Beltrid demands that Sisko use his supernatural ring for evil, Sisko’s refusal turns his world upside down. Trapping Sisko’s wife, Gabrielle, inside the “Crystal of Virtues,” Beltrid sends Sisko and his two teenage children, Nathan and Kaylee, on a journey to find seven virtues that will free her. Simple? Not when a demon is involved. … Reality has ascended, and no soul will remain untouched. 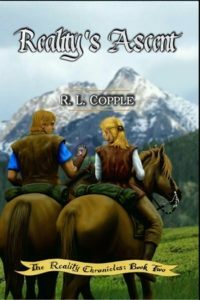 Book 2 of the The Reality Chronicles series, fantasy for teen readers and older.